An Egyptian parliamentary delegation, led by speaker Ali Abdel-Aal, held talks with a number of senior Cypriot officials on Monday. 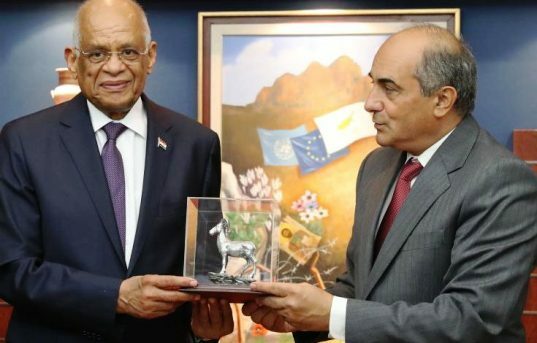 Following a press conference with his Cypriot counterpart Demetris Syllouris, speaker Abdel-Aal said his two-day visit to Cyprus comes to reflect the current excellent relations between the two countries. “We pay an utmost attention to our relations with Cyprus in both political and economic sectors,” said Abdel-Aal. Since he came to power in Egypt in 2014, President Abdel-Fattah El-Sisi has held a number of summits with leaders of Cyprus and Greece to discuss their growing mutual interests in the Mediterranean Sea. Egypt signed a maritime demarcation agreement with Cyprus and conducted a number of joint military exercises with Greece. Abdel-Aal said Egypt fully supports the rights of Cyprus in exploring natural gas in the Mediterranean and strongly condemns Turkey’s aggressive and hostile attitudes towards Cyprus. Speaker Abdel-Aal is due hold talks with Cypriot President Nicos Anastasiades, and their ministers of tourism, energy, and foreign affairs. Egypt’s parliamentary delegation to Cyprus includes head of foreign affairs committee Tarek Radwan, head of tourism committee Sahar Talaat Mostafa, head of energy committee Talaat El-Sewedy, MP and head of the Egyptian-Cypriot Friendship Association Karim Darwish, businessman and MP Tharwat Bassiliy, and parliament’s secretary-general Ahmed Saadeddin.